I think it would be nice if your meal came with a side salad and six French fries. 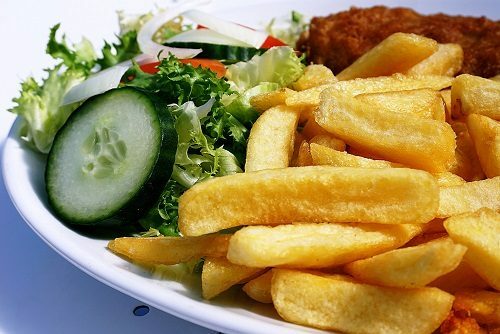 A Harvard professor suggests limiting yourself to six french fries might help you live a longer life. Do Epidemiologists Make Good Dietitians? No doubt, professor Rimm is good at his chosen profession – epidemiology. However, dispensing dietary advice is a tricky business. “Don’t” and “you can’t” has a way of being counterproductive. It’s a great way to promote food cravings. Just look at the pushback that Rimm generated. It’s one thing to look at dietary patterns in a large population. It’s quite another to translate that into dietary guidance and help people find healthier patterns for themselves to follow over a lifetime. For that, we need dietitians. Click here for the article in the Times. For further perspective on the reaction it generated, click here and here. Finally, if you want a broader perspective on potatoes, click here and here. But, the memes and comments were hilarious and so they should be. Everyone’s just so frustrated and trying to find that one thing to make a difference, to get the biggest bang for the buck, so to speak, that it borders absurdity. Not helpful in garnering trust and being taken seriously when it’s hard enough to get folks onboard with effective, reasonable recommendations. Spot on about why we need dietitians! Flimsy attention-seeking comments like Rimm’s just add to the confusing muddle of ‘information’ my clients get bombarded with. Not helpful!